The opening stanza of this hymn echoes Psalm 103, “Bless the Lord, O you his angels, you mighty ones who do his word, obeying the voice of his word! Bless the Lord, all his hosts, his ministers, who do his will! Bless the Lord, all his works, in all places of his dominion. Bless the Lord, O my soul!” (Psalm 103:20-22, ESV) This hymn is based, in part, on the Te Deum laudamus, an ancient hymn that is still used in both the Eastern and Western branches of the Church. As this hymn is sung, contemplate the vastness of creation as it worships God continually, in heaven and on earth, past and present, including angels and Christians of all traditions. J. Athelstan Riley wrote this text in 1906 to the tune LASST UNS ERFREUEN for the English Hymnal, of which he was an editor. Sources for the text include two ancient texts used in the Eastern church, Te Deum laudamus and Theotokion (“Hymn of Mary;” used in choir offices of the Orthodox Church). Riley's special interest in the Eastern church is reflected in the text, especially the first two stanzas, which call upon the nine different orders of angels and on the Virgin Mary (“Thou bearer of th' eternal Word”) to praise the Lord. The Te Deum laudamus (We praise thee, O God) is an ancient hymn that belongs to both Eastern and Western churches, and it is the basis for part of the first stanza, and for the third and fourth stanzas. This hymn is always sung to the tune for which it was written, LASST UNS ERFREUEN; it is also the original English text for that tune. The tune title comes from its original German text, with which it was paired in a Catholic songbook from Cologne, Ausserlesene Catholische Geistliche Kirchengesänge (1623). This tune has the same opening phrase and similar rhythmic patterns to GENEVAN 68. The modern version of the tune is by Ralph Vaughan Williams, who set it for the English Hymnal in 1906. One place in the tune that is subject to tradition is the length of the last syllable in the middle “Alleluia;” it is sometimes sung as written, and sometimes lengthened by a fermata. The advantage of using the fermata is that it gives the congregation a place to take a good breath after the relatively high register of the preceding phrase. Congregations will also likely try to cut short the value of the penultimate note of the song, so the leader and accompanist should clearly indicate when to land on the final note. 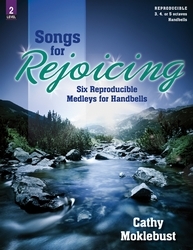 This hymn is a call to praise, suitable for an opening hymn. Try singing in unison for most of the text, except for the “Alleluia” in the middle of the verse and for the refrain, where four-part harmony adds to the feeling of jubilation. Another choice would be to add brass or other instruments, either just on the “Alleluias,” or to reinforce the entire melody, especially if no organ is available. This tune lends itself well to a range of moods in instrumental arrangement; some of the variety that exists is due to the diversity of texts that are sung to it. A comparatively gentle (though moderately difficult) instrumental arrangement of LASST UNS ERFREUEN for violin and piano in “Hymns to the Creator” by Duane Funderburk would work well as a prelude. A glorious organ arrangement that is probably more suited to the grand theme of this particular text is “Festival Alleluia” from “Two Festive Hymn Settings” by Dan Miller. 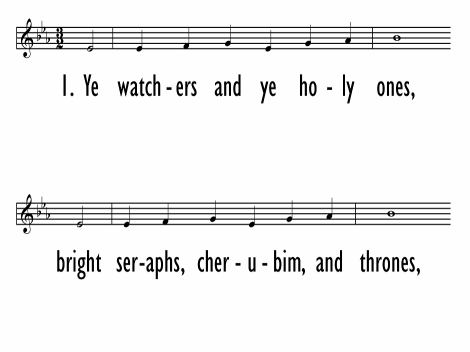 One setting of this tune that sets two texts is “Ye Watchers and Ye Holy Ones” by Charles Thatcher (the other text is the well-known “All Creatures of Our God and King”). 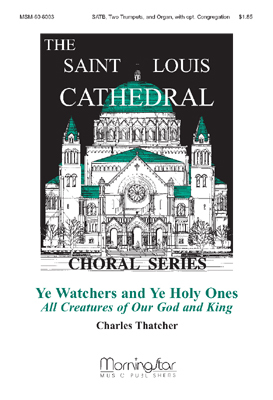 This arrangement is for organ, two trumpets, and choir, with optional congregational singing. Display Title: Ye Watchers and Ye Holy Ones (Gloriosos Ángeles, Alzad) First Line: Ye watchers and ye holy ones (Gloriosos ángeles, alzad) Tune Title: LASST UNS ERFREUEN Author: John A. Riley, 1858-1945 Meter: LM with alleluias Scripture: Colossians 1:16 Date: 2013 Subject: Ascension of the Lord | ; Ascensión del Señor | ; All Saints | ; Todos los Santos | ; Blessed Virgin Mary | ; Santisima Virgen María | ; Rites of the Church | Funeral; Ritos de la Iglesia | Exequias; Alabanza | ; Praise | ; Alegría | ; Joy | ; Canción | ; Song | ; Communion of the Saints | ; Comunión de los Santos | ; Trinidad, Santísima | ; Trinity | Source: Tr. anonymous, alt.